This seems to be our final encounter with the press in regard to the Ball-Badman plan to nationalise home educated children in England. We didn’t contact the local media until a few days after the announcement of the wash-up which finally saw the withdrawal of Clauses 26 & 27 from the CSF Bill 2010 and then it took a couple of weeks for the report to appear in the local paper. (Then it took me another 3 weeks to post it here!) Here then is our swan-song. A Peplow couple are celebrating victory after the Government’s plans to introduce new rules on home education were put on hold. 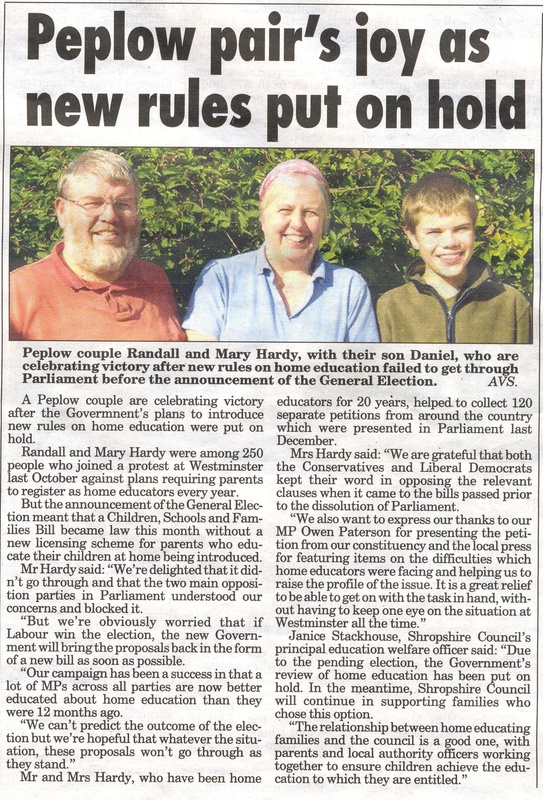 Randall and Mary Hardy were among 250 people who joined a protest at Westminster last October against plans requiring parents to register as home educators every year. “But we’re obviously worried that if Labour win the election, the new Government will bring the proposals back in the form of a new bill as soon as possible. “Our campaign has been a success in that a lot of MPs across all parties are now better educated about home education than they were 12 months ago. 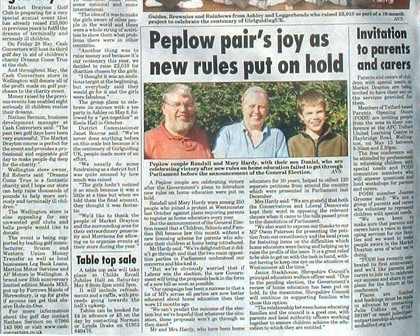 Mr and Mrs Hardy, who have been home educators for 20 years, helped. to collect 120 separate petitions from around the country which were presented in Parliament last December. Mrs Hardy said: “We are grateful that both the Conservatives and Liberal Democrats kept their word in opposing the relevant clauses when it came to the bills passed prior to the dissolution of Parliament.